With contributions from Kenny Graves and Ingrid Sabogal. 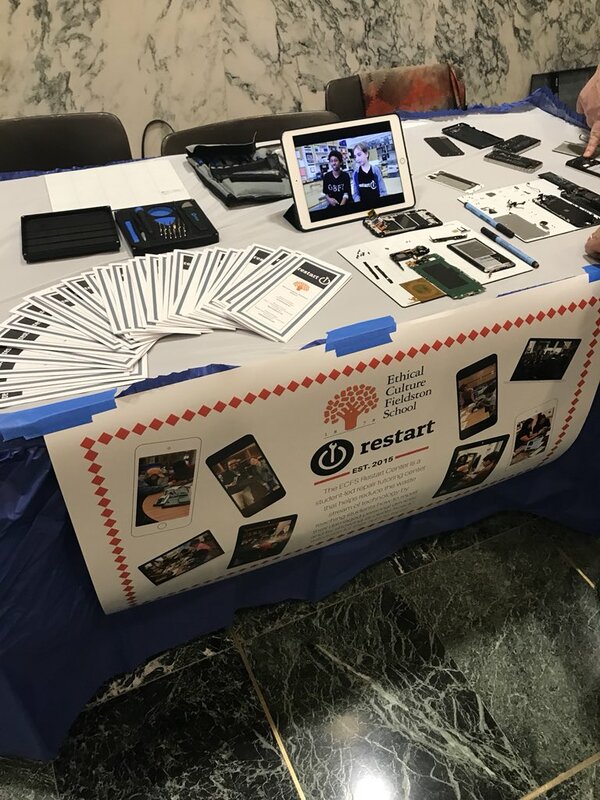 As part of an invitation by the Repair Association, the ECFS Restart Center was invited to the New York State State House to pass out brochures on our student-led repair center and to urge state representatives to support Right to Repair legislation. We set up a table in the New York State legislative building and participated in a press conference supporting a new bipartisan bill that would allow everyday consumers the right to repair their devices. Currently, there are 18 states that are developing bills that would preserve the right to repair electronic devices. New York State is one of the first states to propose and argue for a full bill protecting consumers’ rights to repair their digital devices. Below are activities for adults and students to support Right to Repair legislation. Join the Repair Association. Dues help sponsor in-person activism and support for Right to Repair bills. Remove illegal “void if removed” stickers from your devices and share your finds with others in an online sticker hunt. Talk with students about the impact of fair repair legislation on their ability to tinker and repair their devices (activity below). After going to Albany with @RepairCoalition to advocate for the #RighttoRepair on Tuesday, a bunch of us worked with 5th graders to do a mini lesson about how to talk about the bill with adults in their lives. We took a moment to observe the screws and talked about how manufactures use different screw heads, making repair easier or more difficult. We showed them a few other types of screwdrivers (Torx/Pentalobe) and kids mused how hard it would be to get that many tools for each repair (Yes!!!). Before opening up the back of the device, we asked what might you need to next to successfully repair the laptop. One student replied, “Instructions, I’ve never done this before. I don’t know where to start.” We pulled up iFixit to show what readily available, easy-to-understand manuals looked like. We removed the back cases and used the manual to identify different components. We observed screw heads and investigated which parts of the device might be removable/repairable. Referring to the instructions, the kids picked up that many components seemed easy to remove. We asked if any of these parts were broken, what else would I need to complete a repair? Students quickly said new parts, and had lots of questions about where they come from. We talked about Original Equipment Manufacturer parts and how to find them. Student had lots of questions about cost and availability.